It wasn’t that long ago when a German steel mill fell victim to a cyber attack that resulted in parts of the plant failing and a blast furnace workers could not shut down through normal methods. The plant suffered “massive damage,” but one aspect not really played out was how the bad guys got into the system. Exploitation of the mill took place thanks to targeting of on-site personnel in the corporate network, according to the German Federal Office of Information Security (BSI). The phishing emails contained a document that hosted a malicious code that would have taken advantage of vulnerabilities in the target’s system. That meant all the technical security measures went out the window because the attackers were able to glean proper credentials. The attack on that German steel mill was just over four years ago, and security awareness today is sky high, but it is a safe bet to say workers in the manufacturing automation sector need to understand the basics to ensure they, or their company, do not become the next victim of a cyber incident. The sophistication level of the bad guys has evolved to the point where they can customize an attack to a particular target and even specially modify, craft and deliver it in a way that is intended hide in plain sight and fool people who support critical control systems. “There are increased campaigns around social engineering and targeted attacks against certain industries,” said Peter Clissold, Sr. Cybersecurity Consultant for Schneider Electric in Brisbane. With a top concern of security professionals going into 2018 being the lack of competent in-house security staff, according to a Ponemon Institute Survey, it only makes sense workers need to become much more aware of their security surroundings. According to the survey of 612 chief information officers and IT security pros, two of the top four threats play hand-in-hand: Lack of competent in-house staff was the stop worry and inability to reduce employee negligence was the fourth fear. With that lack of qualified security workers and worker negligence, educating workers and creating a stronger cybersecurity culture – much like safety – should be a goal for any program moving forward. 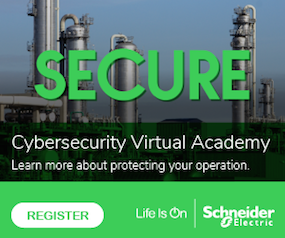 “Companies themselves really have to drive security awareness into the people,” said Joshua Carlson, Subject Matter Expert and Technical Sales Leader for Cybersecurity at Schneider Electric. “Where are the threats coming from, what are some of the things we are doing, let’s not click on links, let’s not open unknown attachments, let’s not plug in removable media devices we found in the parking lot, let’s not find loopholes in the security systems to bring our own devices in to corporate networks. Some of the best practices for everyone to follow is to just show some good basic common sense, but they still need solid security concepts ingrained into workers’ minds. That means there must more than just an occasional reminder about security issues. “In any organization if you look at any regulation like NERC CIP (North American Electric Reliability Corporation critical infrastructure protection plan is a set of requirements designed to secure the assets required for operating North America’s bulk electric system), you have to have regular training for people on cybersecurity,” Gauci said. Training must also be an ongoing thing that is measurable. Once everyone knows that security is part of a performance measurement, it then can become entrenched within the organization.